Junior Robert Herman (Mechanical Engineering) is a serial tinkerer. Between Thanksgiving and Christmas, he converted a bicycle into a hybrid electric/pedal bike to manage the five miles of hilly terrain between his home in Coventry and the UConn campus. Like electric cars, the hybrid bike is remarkably quiet and gets great mileage: about 15-25 miles per charge. The assembly includes a lithium iron phosphate (LiFePO4) rechargeable battery, motor with a re-wound armature for enhanced power, motor driver, speed controller, 24 volt charger and battery management system that balances the battery voltage. After assembling and testing the bike, Robert enclosed everything in an aluminum casing that he machined himself, adding weather stripping to prevent moisture from seeping into the pristine assembly. 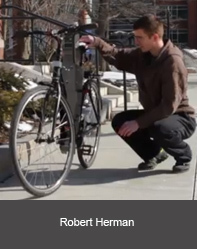 Unlike most UConn Engineering students, who arrive on campus with degrees from traditional high schools, Robert is a graduate of Windham Technical High School. While he trained for the HVAC trade at Windham Tech, Robert taught himself machining technology and developed more advanced skills in the design and construction of complex machines. Robert thrives on “projects” and always has at least one underway. He confesses that movies are a source of many ideas, and games flexed his creative aptitude. Most projects are executed in the family basement/design workshop. This school year, Robert has worked in the Adaptive Systems, Intelligence and Mechatronics Laboratory of Dr. Chengyu Cao. Robert contributes toward the design and manufacture of a prototype autonomous underwater vehicle (AUV), along with the mechanical and some electrical components – including the AUV’s circuit boards and wire components – on the testing platform. He also conducts independent research within the AIM lab. During the fall semester, he learned a programming language and began to develop code intended to direct a Nao humanoid robot to walk. His current efforts focus on a four-legged spider robot. For this project, he has developed a stereoscopic camera setup with the aim of converting the camera’s two-dimensional images into three dimensions so the robot can effectively navigate a room.